We love our furry little friends, don’t we? So much that we call them family! And when the family goes on vacation that means everyone comes along. Just as we are hesitant to leave our children in the care of strangers, we feel a little stressed leaving our fur-babies with a stranger but there some things to consider when traveling with a pet. These days more people are traveling with their pets; including them on vacations, cross-country getaways, and weekend trips. But taking them with us creates its own set of concerns. Will they tolerate it well? Where can we stay? How will we travel? Is safe to board an airplane anymore with a pet in tow? What exactly should you expect from a hotel that claims to be pet-friendly? The list of questions to answer can go on and on. It is very important to do your due diligence and research the places you will go and stay. And to know the rules and regulation that will keep your family member safe. With a lot of planning, a little bit of common sense and these tips, you can plan a trip that will be fun for all! Working your pet’s needs into every step of the itinerary is easy and conducive to a good trip for everyone. If your pet feels stressed out or poorly cared for, no one will be able to enjoy the trip. Here are some things to consider when traveling with a pet. Does your pet travel well? If you’ve never flown with a pet before, you might not know the answer. But you can tell a lot about their potential travel habits taking a closer look at their personality traits. Does your little on getting stressed at the mention of a car ride or get motion sickness in the car? They might not be cut out for a road trip. My mini-poodle Lucy pants profusely and refuses to eat or drink during a car ride without sedation, so she’s not the most willing travel companion unless she absolutely has to be. If she travels with me, I’m sure to keep things local. For longer or farther travels, I pass the leash over to my neighbor so she can feel comfortable close to home. Are you planning to drive? Fly? Hop on board a train? Take a boat or cruise? You will most likely be using one of the first two to get to your vacation destination but depending on what you do along the way may encounter the latter. Each of these methods of travel comes with its own concerns for transporting your pet. If you need to fly, time of the flight and size of the pet will impact your plans. Most airlines will let you the best times to transport pets for maximum comfort. If you have a pet small enough to fit under the seat, you can fly anytime. Car rides are a little different. The most important thing to keep in mind, in this case, is that your pet will need to stretch their legs, move around and use the bathroom every few hours. Just like we do! Don’t try to cram a 9 hr drive into two stops for the sake of getting there quicker. In either case, remember to hydrate your pet and avoid feeding them a full meal before in order to avoid upset stomachs during the journey. If your pet is kennel or crate-trained, bring it with you, your pet will feel more safe and secure. This is a huge thing to consider when traveling with a pet. Look for pet-friendly hotels on the internet and travel sites like Bring Fido and Official Pet Hotels. Ask some friends who have traveled to your intended location where they have stayed. Or check out a facebook group where people frequently travel with animals. 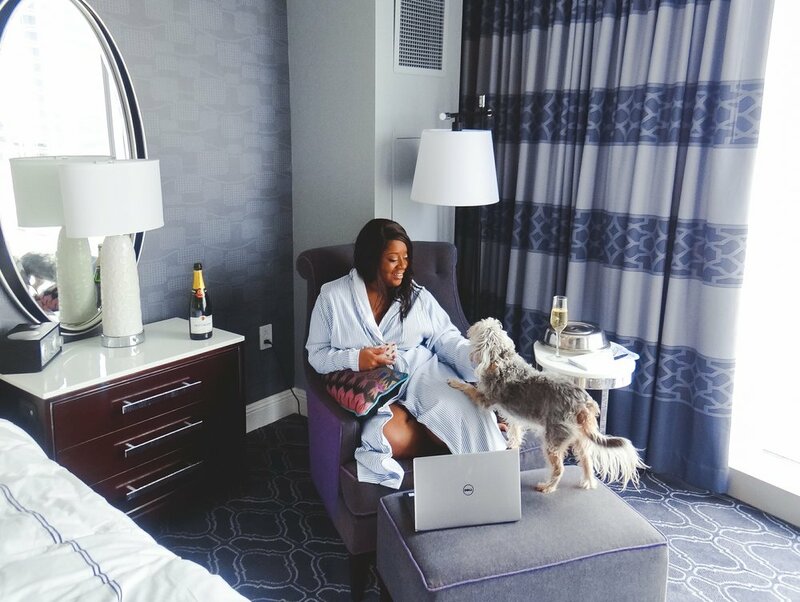 Hotels that claim to be pet-friendly often only tolerate pets for greater exposure and book-ability, often charging more money for deposits and pet fees. Sticking you in a smoker’s only room isn’t the same as a pet-friendly room. Phone hotels, check their sites and reviews and find out what their policies are regarding pets. 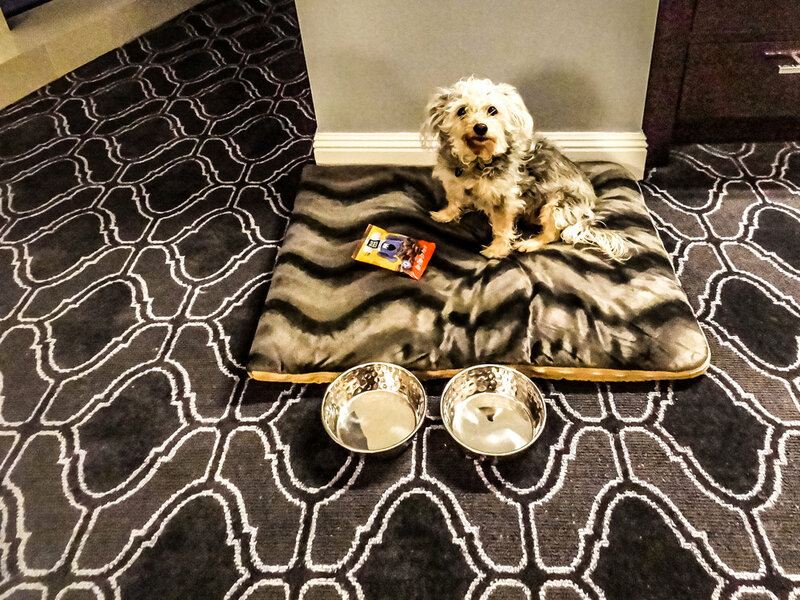 Truly pet-friendly hotels will add little comforts, with your furbaby in mind. Some great ones will provide a bed, bowls for food and water, treats and snacks and access to dog parks or maps to parks close by. These are the hotels to look for – the ones with few restrictions, who view the pets as guests in their own right and will provide things to meet their needs as well as their human guests, but without focusing solely on the profit. Look for not only pet-friendly hotels but pet-friendly restaurants and activities too! Do your research! When traveling with a pet – keep it on your schedule, meaning even with time changes your pet will have to adjust just like you but do it gradually for them. Bring their food and bowls, bedding, toys and leash to ensure that they are comfortable and have familiar items to ease their travel anxiety. Never leave them alone in a hotel room, cabin, or other space. Remember, pets are like children – not everyone likes them! Keep them on a leash at all times, and never let them be bothersome. Pets are part of our families and they need to be taken care of with love, attention, and some discipline.